So a few months ago I made cards for this thread. I fell in love with the idea of a blue aligned plane. Blue is magic of push and pull, matches of wit, and the closest color to chess. I occasionally hear the choicemaking of mtg compared to chess. So, you and me, let's make cards that take that to the next level. So my view of Vryn is different than the old thread. The information we have shows there are two groups: the separtists and the Ampryn league. They constantly fight. There is also a wealthy class and a poor class. Whether this is a separtist vs Ampryn configuration or a plane covering problem is not known. We know there are mage rings that control the flow of mana. Why are they at war? Why is there a push and a pull? In my view of Vryn, the Ampryn league and the Separtists are basically equal entities, but it is believed the Ampryns have much more wealth than the Separtists, which makes the Separtists fight for resource gain. The two sides constantly take and retake critical points of the plane. The weird thing here is the need for balance. I see Vryn as a blue-white plane. Balance is important. So, there is a reason balance has to exist. A coalition of powerful mages, including the mysterious Alhammeret from Magic Origin, have an enchantment on the plane. This coalition can get whatever they want as long as mass war and balance between the two sides is kept. They keep this secret closely guarded. 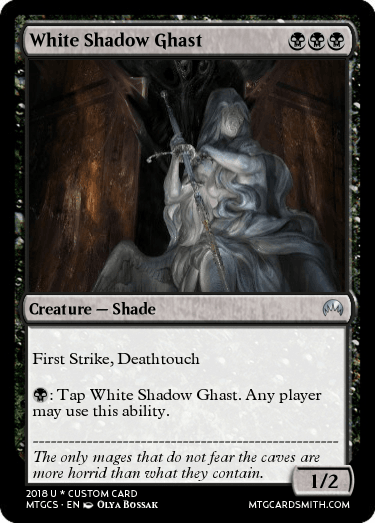 Instead, similar to what it seems Alhammeret made Jace do, they foil plans of the warring factions that would shake the balance too much and sometimes fall to committing Genocide for the protection of their power. Mechanically, reactive elements fit. It is fun to set traps for your opponent to struggle to tiptoe through while on the other side it is fun to piece together a solution to the deep situations your opponent poses. Design cards that add a level of complexity to the board state in a fun way! 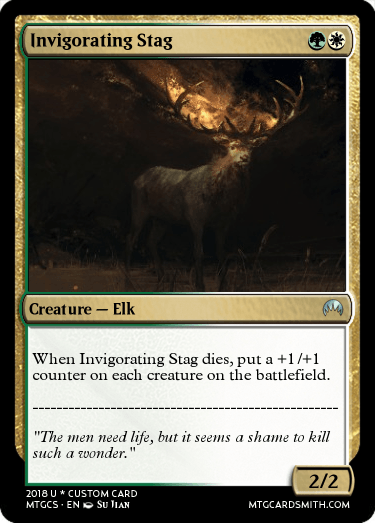 In my design, which has been on and off for months, I find cards that hit the entire board or cards that react to your opponent catch this idea, but whatever interests you shoot for it! I also used circles whenever possible to lead back to the idea of the mage rings and the classic trope of magic circles. I made Checkmate and Underdog as opposing mechanics. Many people didn't like them when I first introduced them, so if you have any ideas on how to make them more fun, let me know! I know either mana costs or rarities are off on some of the cards, but they are more for getting ideas into your head. Here's my entry. Can your opponent outthink you and guess the card? Not if you're as wily as Coyote. Coyote is a creature of unknown origin inhabiting the deserts of Vryn. Constantly traveling, Coyote illegally taps off power from the mage rings to fuel his schemes, which constantly change and shift unpredictably. @Undead I like it! Its effect looks Vryn even if the flavor seems left field! Yeah, sorry about that... I've just always wanted to make a coyote card based on the mythical trickster. @brcien Hey! 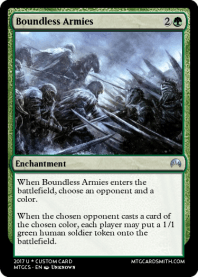 I was wondering if you have any planeswalkers in mind for this set. If not, I'd be glad to design some for it! The idea of a planeswalker arriving on a world at war is quite exciting to me. I can't promise anything, but show me what you're thinking? Vryn is the home plane of Jace, but I like to think this set wouldn't have him be the main player. Shoot! Sorry for the late reply, I was expecting any response to show up in my normal disqus notifications. Oh, and while this isn't a planeswalker, I did make an amphryn card, one of the individuals dedicated to keeping Vryn in a state of conflict. At the risk of flooding this thread with just me talking to myself, I've been wondering, do you see room for any new keyword mechanics outside of Checkmate and Underdog? I feel as though Vryn has a lot of potential for that. So if you're pitching a planeswalker, you gotta give me some story first. They are so important that you can't just slap one in. Ampryn Overseer is busted. Way way too strong unless he had some serious downside. Yes! In fact underdog was quite poorly received when I first pitched pitched it so maybe there's a more fun way to do it. Both fair points! I'll tweak the Overseer a pinch, and I'll hit you with a story in but a moment. Sana hails from the shard of Bant, a place of peace and prosperity, a world that tought her honor, justice, and (most importantly) strategy. During the reunion of Alara's shards, Sana found herself horrified with the sheer discord of the other shard's realities. In a moment of fear, passion, and righteous disgust, her Planeswalker spark ignited, sending her to a new plane: the checkerboard world of Vryn. In Vryn, she saw a world with potential. A world that could one day be united under a single banner... Ampryn's banner, of course. Taking a "peace through conquest" outlook on life, Sana spends her time guiding the soldiers of Ampryn into perfect clockwork patterns, collecting reconnaissance from their attacks, and ensuring victory with her own arcane knowledge. aaaaand Doffel has been suitably nerfed. Now he's a bit more versatile but a lot less suffocating. 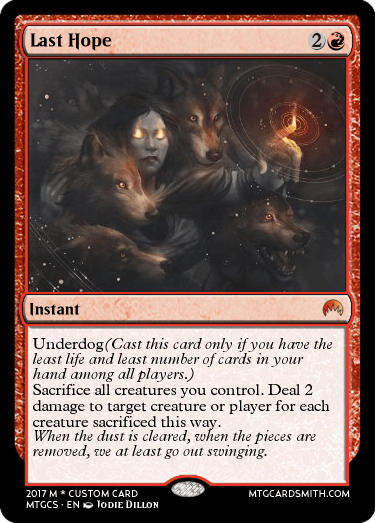 Also, as for how Underdog could be buffed, I would suggest making it similar to Revolt, both because they're flavorfully similar, and so that it activates on a specific game state condition instead of being "this is discard fuel until you start losing". 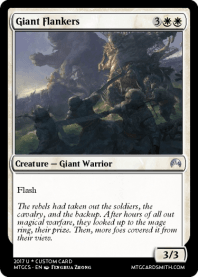 For example, "Underdog - If your life total became the lowest among players this turn, create two 1/1 white Human Soldier creature tokens." Bant would be interesting, but specifically her igniting when the shards split would probably have been a big enough deal that they would have put her in the Alara storyline. Fair enough! I can change that bit, however I still think Bant is a good homeworld for a character trying to change a Blue-White plane for (what they see as) the better. Also, have you thought about limiting the two faction's color identities? Perhaps the separatists could be Red White or Red Black considering their emphasis on being against the authority of Ampryn? I think limiting color identities here is racist. The separatists aren't evil. They are just as correct to fight as the Ampryn league. The true villains of the plane would be the mages that keep the balance so that the fighting will continue. But seeing as they are few in number, the balance mages wouldn't be a group themselves. 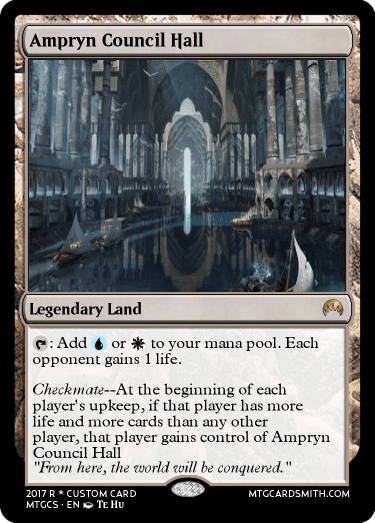 I think if color pie didn't matter, ampryn would be Azorious or Bant and Separtists would be Boros or Mardu. Ah, sorry. I'm just as against the whole "the separatists are clear cut villains" thing as you are, but I like to view black/red less as "villainous" and more as "independent". At their core, they are the colors of "chaos" and "self-interest" which isn't actually a BAD thing. 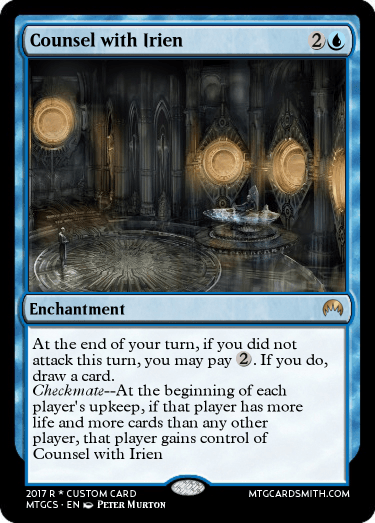 Take the Dethrone mechanic (one that exists primarily in Grixis) for instance. 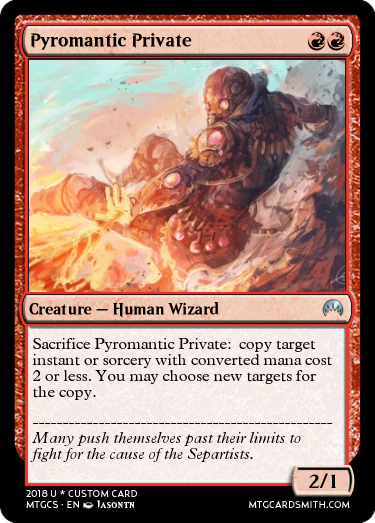 While Marchesa (the Dethrone Lord) may have villainous intent, the mechanic could be recycled into "standing up against the bullying monarch". If we do end up limiting color identities, I would love to design a truly non-villainous red/black guild, because I think there's a lot of potential there (both story-wise and mechanically). An example of what I'm saying here. The art is maybe to oriental for a Vryn flavor, but I like the mechanical design. What else you got? Ah! Apologies! I swear, I keep checking the thread all day until the /exact moment/ you respond. Dosyra is a hulking demon who serves under the orders of the megalomaniacal arbiters of Vryn. He takes control of powerful figures of each faction, puppeting them around as his masters desire. 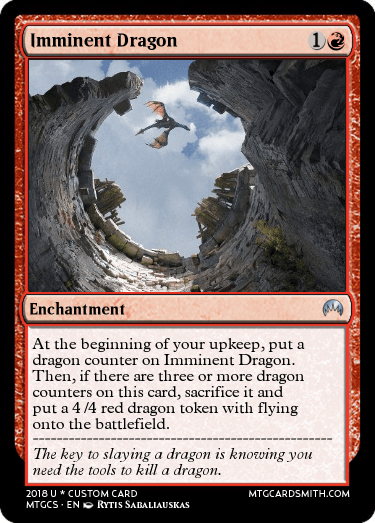 @brcien can Underdog be put on instants or sorceries? I have a couple ideas for the ability. Hello to you too @ErinsCards, nice work you guys got going here. 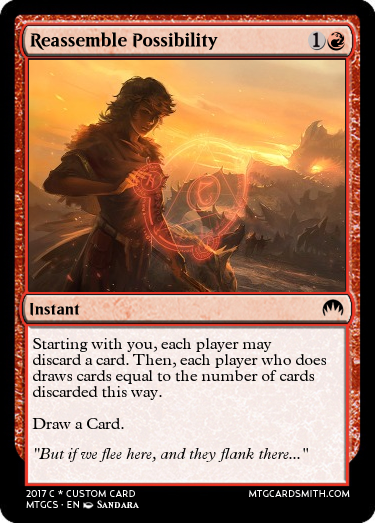 Do you guys mind if I make you some cards? Take them or leave them, I'm aware its just for fun, and this looks fun. I'd like to know more to the planes walkers story @ErinsCards.